Joey Dragman is the Founder and Managing Director of the food service and training company Joey-D Foods. In an effort to be the leading food service and training company, Joey-D Foods use locally sourced meat and vegetables. Joey obtained his Bachelor’s Degree of the Suriname Hospitality and Tourism Training Center in 2014. Two years later, he won the National Culinary competition with a traditional Javanese dish by putting his own twist to it. YLAI goal: To build relationships, interest partners, and develop long lasting friendships. Joey’s quote: “As a leader, I find it important to spend not only enough time doing research, but also to focus on other organizations to help solve identified issues”. Saïd Muntslag is the Founder and Managing Director of LEDSUR N.V. The mission of this company is to improve a building’s energy efficiency and reduce its carbon footprint while delivering energy costs savings to the owner. LEDSUR achieves this by improving the energy efficiency of a building by implementing state of the art LED lighting systems. One of the goals for this year is to expand LEDSUR’s market to include Aruba, Curacao and St. Maarten. Another goal is to reduce CO2 production by 50,000 tons by the end of 2020. Saïd holds a Bachelor’s Degree in Mineral Resource Management from Anton de Kom University in Suriname. YLAI goal: Broaden my perspective by learning from others and to give back this knowledge to my community. 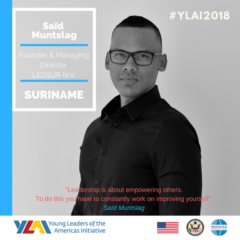 Saïd’s quote: “Leadership is about empowering others. To do this I have to constantly work on improving myself”. 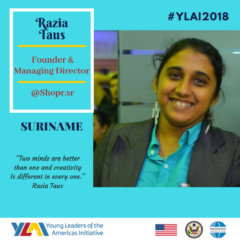 Razia Taus is the Founder and Managing Director of @Shopr.sr. This enterprise brings quality printing services to rural areas while creating local jobs and promoting sustainable ways of living. As a Global Shaper and former curator of the Paramaribo hub, she is currently working on a project to produce of biodegradable product to replace plastic. Her goal is to make Suriname plastic free by 2020, or at least get a ban on all plastic and foam products and material. Razia will soon receive a Master’s Degree in Sustainable Management of Natural Resources from Anton de Kom University in Suriname. YLAI goal: Become a more enriched entrepreneur and contribute to enrich others. Razia’s quote: “Two minds are better than one and creativity is different in every one”. 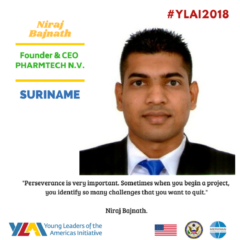 Niraj Bajnath is the Founder and CEO of Pharmtech N.V., a company focused on exporting a variety of top quality agriculture products, primarily to the Caribbean marketplace. He believes that Suriname has the potential to become a significant exporter of agricultural products given its abundant and fertile land, and wants to position Suriname as a hub to the CARICOM and UNASUR member countries for food export. Niraj holds a Bachelor’s Degree in Business Management from Anton de Kom University in Suriname. YLAI goal: To sharpen my leadership competence by learning from other successful leaders and business entrepreneurs. Niraj’s quote: “Perseverance is very important. Sometimes when you begin a project, you identify so many challenges that you want to quit”. 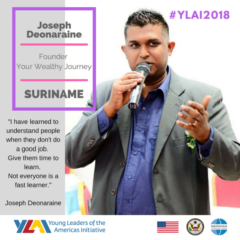 Joseph Deonaraine is the Founder of Your Wealthy Journey (YWJ), a company that stimulates entrepreneurship in millennials by delivering free content and business services that help them to achieve their business goals. YWJ’s website provides interviews with experts, blogs, and free e-books among other resources. YWJ’s objective is to create a clear path for its clients to achieve their business goals. Joseph holds a Bachelor’s Degree in Business Management from the Anton de Kom University in Suriname. YLAI goal: Learn as much as possible during the program and create strategies and systems to implement the lessons learned. Joseph’s quote: “I have learned to understand people when they don’t do a good job. Give them time to learn. Not everyone is a fast learner”.